After quite a long time, I read a short, sweet classic story and I am feeling really good after reading it. 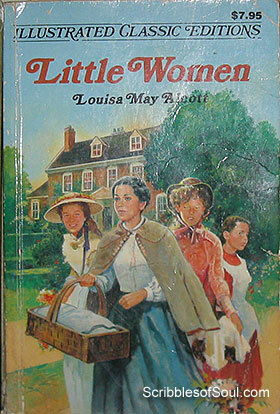 ‘Little Women’ by Louisa May Alcott is a story of March family, consisting of an absent father, a loving mother and four lovely sisters Meg, Jo, Beth and Amy. Each of the March Sisters is unique in her own special way. Meg is the eldest and full of dreams, Jo is an imaginative and promising writer, Beth is shy but a talented musician and the most helpful and affectionate of them all and Amy is the youngest, the most spirited and of artistic bend and in the initial phases slightly self-centered. The story progresses on the changing relations between sisters as they grow up and enter into the outer world. Meanwhile, a young lad Laurie enters the story and the lives of all the March sisters is changed for good. It is a story about a family that sticks together in challenging times and provides the required warmth in winter phase of one’s life. How the family lives though the ups and downs of life and faces the tantrums of four young girls forms the basis framework of the novel. To Louisa’s credit, she has successfully portrayed a cute family, which may be lacking in material comforts, but is abundant in love and affection and engaged the reader easily into its everyday problems and small joys. While reading the story, for a small time, I was transported into the Old World charm of America in the mid 19th Century and enjoyed the book for all the time it lasted. The only hitch is the book is too short and I finished the story in just one and a half hours, leaving me hungry for more of it. The book is written in plain, simple English and makes for a good light travel book.